tce.installed needs to have insmod /usr/local/lib/modules/4.14.10-tinycore64/kernel/fs/cifs/cifs.ko.gz followed by a modprobe for the extension to be functional, or at least a note in .info saying "install/load the module manually and THEN try the example shown! Filesystem modules are autoloaded when you try to mount something with them. No manual modprobe is needed, just tested. When the mod is installed manually, everything works as expected. Thoughts? edit: I now tested with mount.cifs. The module still got autoloaded. @curaga: Thank you for your reply. Yes, I tried mount -t cifs first (followed by mount.cifs) and both types received an error stating the kernel didn't support that particular file system. Since then, I have a safety valve in place which (bootlocal) tests lsmod, if CIFS isn't listed, check to make sure the TCZ is downloaded and also exists in /tmp/tcloop (properly loaded) and of course, if anything fails, insmod followed by modprobe. So far, it has to install-module after each boot. IF SO, I have a whacky installation going on here; third machine with a clean installation (HDD) and I'm showing the link to /usr/local/lib/modules/4.14.10-tinycore64/kernel/fs/cifs (cifs.ko.gz) which points to tcloop/filesystems-KERNEL but it is not loaded. (Possibly an oversight with tce.installed script?? It's empty.) 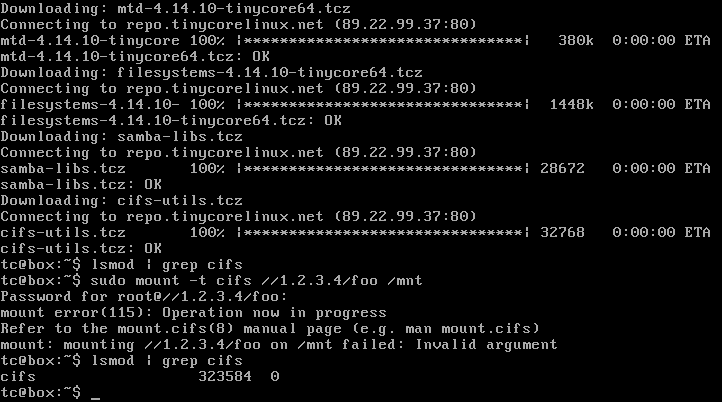 mount.cifs only has a link pointing usr/local/sbin/mount.cifs to /sbin/mount.cifs -- no check there to see whether or not cifs' module is installed/loaded. FOR ME, I'm just adding insmod/modprobe to my startup scripts -- for anyone else this might pose a problem unless the don't mount remote smb/cifs directories.